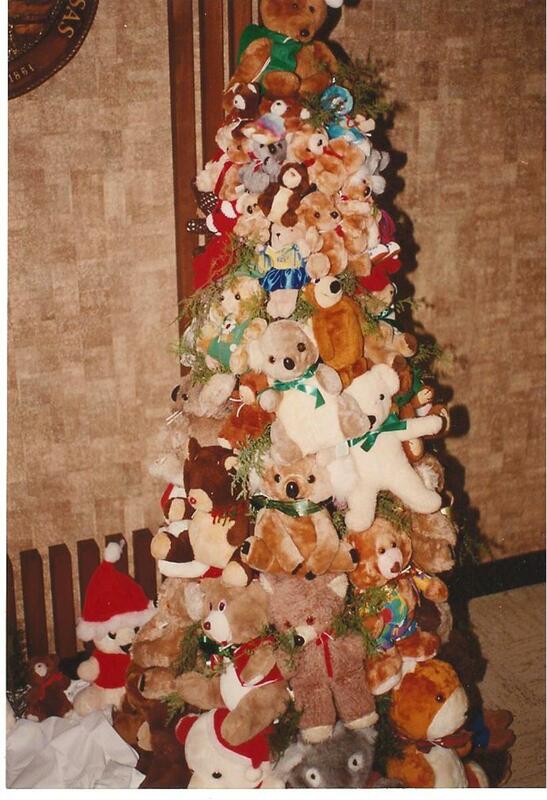 Who wouldn't love a Christmas tree made entirely of cuddly teddy bears? It was an annual tradition at the Butler County History Museum in my hometown. People looked forward to taking their children to see the unique tree each holiday season. The creator shared with my mother the method for making this. It really isn't that difficult once you make the framework. Store that away to use each year. It does take a little time to attach the bears to the frame but the results are worth it. If you already have a large collection of teddy bears, then you are ready to make a tree. A quick way to get enough teddies is to visit all the thrift stores nearby. The prices are usually quite reasonable and you will get 5 or 10 at each store. It takes more than 50 bears to fill the tree. 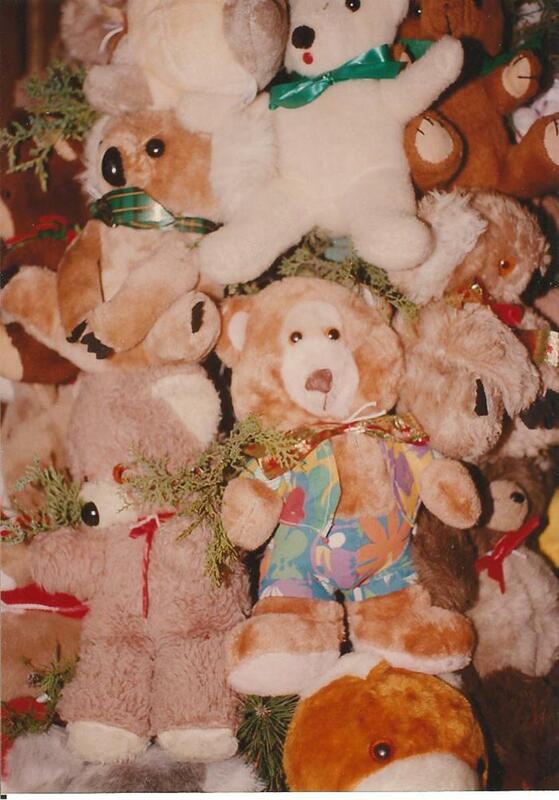 Who Created The Teddy Bear Tree? 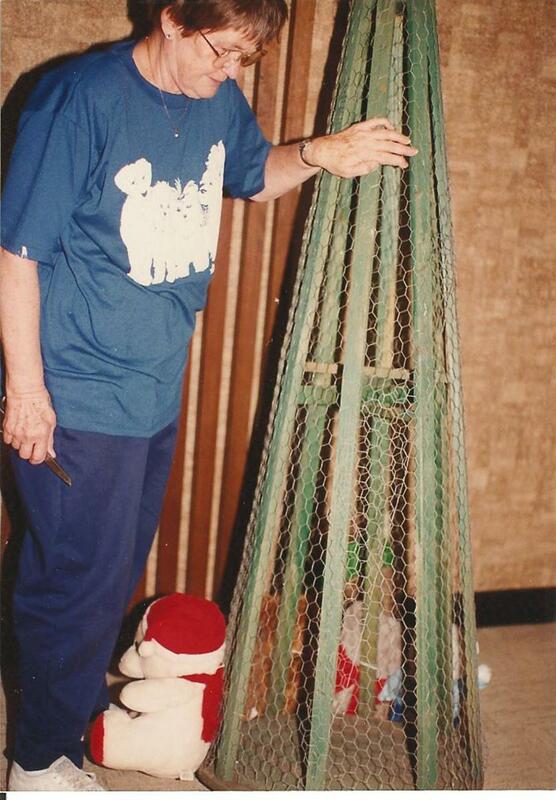 Teresa and Lee Grange of El Dorado, Kansas made the unique tree and put it up each Christmas at the historical museum. 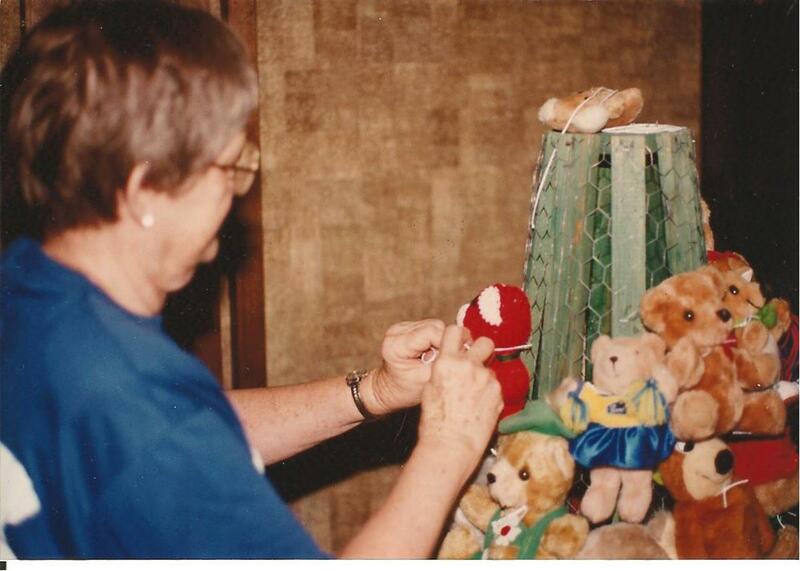 She said she found most of her teddy bears at yard sales and some were gifts to her. 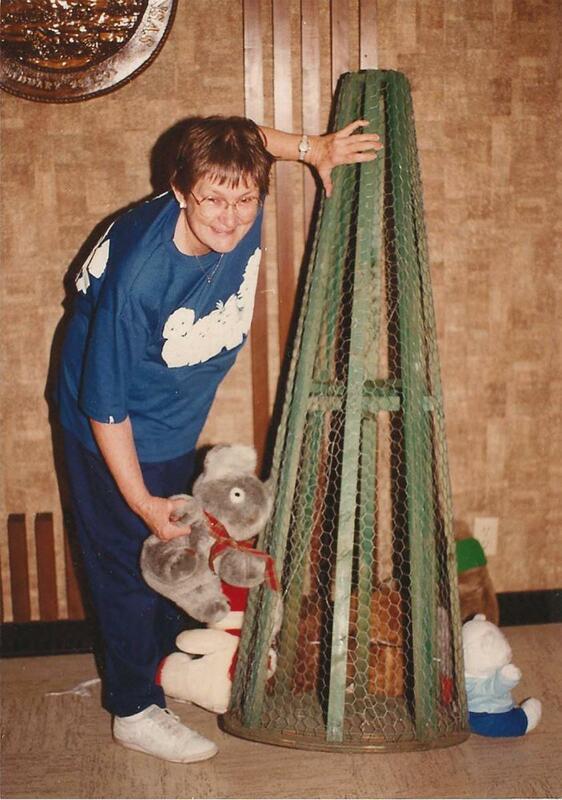 Two really special bears on the tree are named Bertha Beargartel and Dale Beargartel. These are the creations of her friend, doll collector and craftsperson Bertha Baumgartel of Howard, Kansas. 1. Use a large wood circle for the base of the tree. The size depends on your desired end result. This is what you will attach the wood lathe to. 2. A smaller wood disk part way up stabilizes the tree. Use a very small one at the top. Look where her left hand is and you will see the smaller wood disk. Above her right hand is the smallest disk. That gives you three disks to attach the lathe to. If you have sufficient storage space, you can leave the framework for the tree assembled and store it whole. Put it in your garage or your attic or basement. That saves you a lot of time when next Christmas rolls around. All you have to do, is dust it off and put it in place. Start adding the teddy bears. 3. 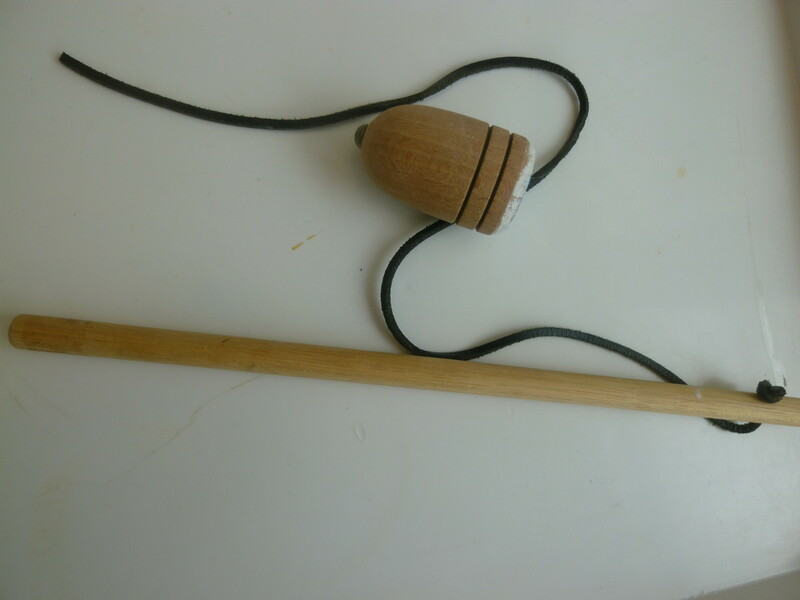 Attach wood strips or lathe to the base, the center and top. They painted these green but they won't be seen once the teddy bears are added. 4. Wrap chicken wire around the frame you've created. Attach this with a staple gun. Be sure to turn under the sharp ends or trim those off with wire snips. 5. Place the tree-shaped frame where you want (it's best not to try moving it once the bears are attached). 6. Tie the teddy bears to the chicken wire with sturdy twist ties then add a pretty ribbon around the neck (put that through the chicken wire also). Fill the whole tree with bears with the bigger ones at the bottom and smaller bears at the top. This part is rather time consuming. 7. Put sprigs of evergreen between the bears to fill any gaps. At the museum, they used Kansas cedar boughs. You could use the parts of an old artificial tree or fresh greenery. Notice how varied the teddy bears are. That adds to the charm of the tree. Here you see white teddy bears, brown ones and all sorts of sizes and expressions on the stuffed animals. This goes around the lathe frame to support the bears. You can find this at a farm supply store or order it from Amazon. If you feel you don't have the DIY skills to assemble the base for the teddy bears, find a friend to help you out. As the handy pal constructs the base from the lathe and chicken wire, keep an eye on the process. Maybe next year, you can put that together yourself. If you have storage space for the base, like a garage, basement or attic, put it away fully-assembled. Next year, just pull it out and start attaching the bears. Many household already have one of these on hand. Make sure you have plenty of staples for it. Do You Have Lots of Teddy Bears? This one is pretty fancy and you could feature it on top of the tree. It changes colors in the wings and even plays a Christmas tune, Silent Night. Where Can You Display the Tree? 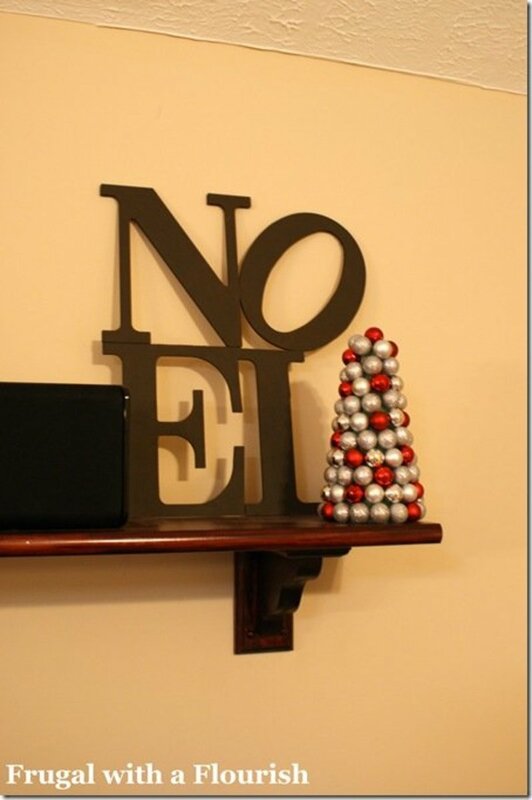 Besides having the tree in your own home, it would be a big hit in public places where more people can see it. How about in the public library or the local museum? The one shown here was displayed a number of years at the Kansas Oil Museum in El Dorado, Kansas. I had a couple of spare smaller artificial trees, and I didn't do all sorts of wiring or chicken wire bases or any of the usual things that instruction guides tell you to do. I just stuck a couple of broken bricks in a bucket to stabilise the trees, then wrapped the buckets in festive paper. Then... and I love that I thought of this .... all I did was use a ton of RUBBER BANDS, one around the neck of each bear and just slip the tip of the branch behind the head/neck of each bear. Worked like a charm. It was flexible as needed but still creates a firm hold/grip, while being invisible at the neck of the bears. It meant the trees could take quite a bit of rough handling and moving around, and the bears stayed with it without dropping off hooks and stuff. There was no need to be untying ribbons and fiddly stuff if the tree concept is to give a group of kids a bear each; the rubber band just releases the bear and off it goes to its new home. Great flexibility, and makes it easy to move each bear around the tree until you have a nice even distribution of bears. I put tiny ones on the top and graduated the sizes to the biggest ones at the bottom. And then just picked a color theme of decorator balls and tinsel, with a star on top. It is simple to learn how to do it yourself when you have a great self help guide showing you how! The DIY instructions and free self help downloads HERE will make sure you succeed in your project! Are You Ready to Make a Teddy Bear Tree? I bet you have some teddy bears already on hand. What a delightful idea! Thank you for your clear, user-friendly instructions. Beautiful lens! Super idea. Should have kept my teddy bears. Thanks once again for an awesome and unique idea. this is an interesting project and saves a tree. This is great. I was just given a lot of very gently love Teddies. I have cleaned them, and if necessary, repaired some items. I have also removed all noses and things that little ones could get hurt with, and embroidered them on. Now I have enlisted the help of several service clubs and we are building these for the communities. 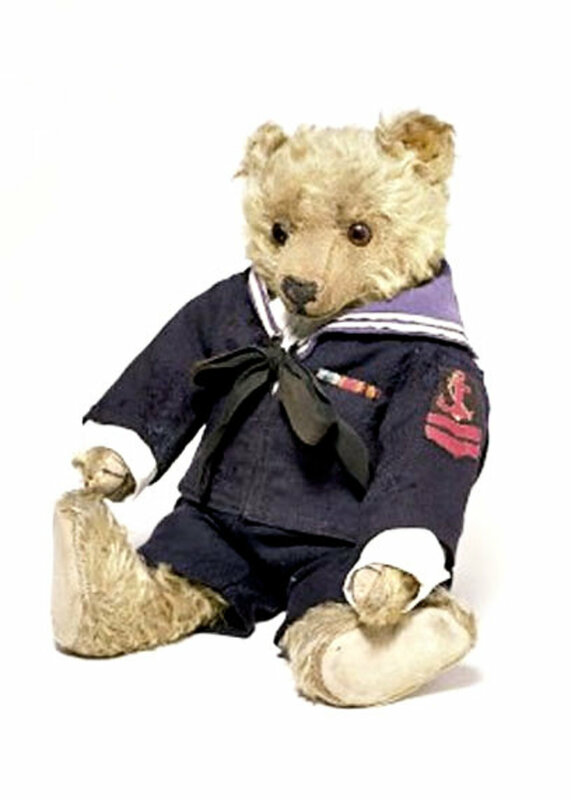 Every little one should have a teddy. This tree should help us give out the 3000 teddies that we have collected. Thanks for a great way to make Christmas a Christmas for our kids. I love this so much! 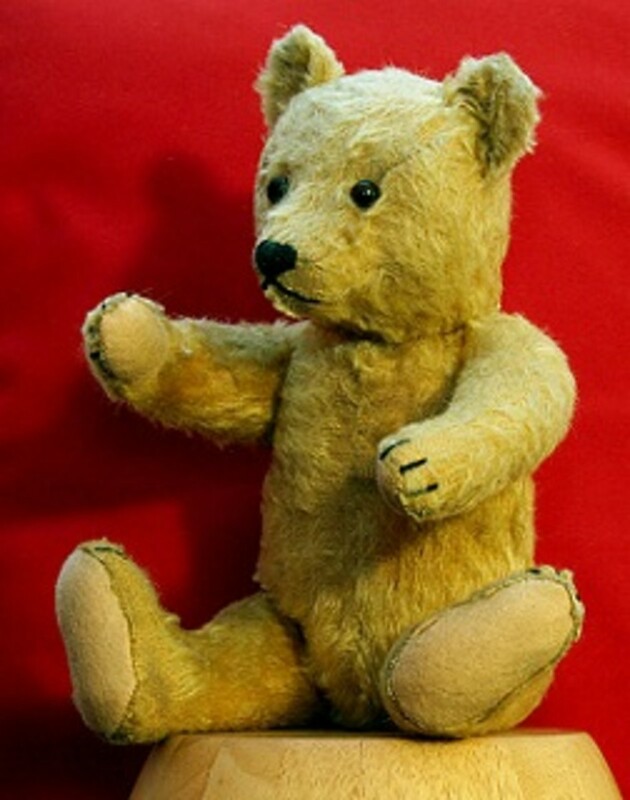 Wouldn't this be a lovely project for a boys and girl's club - and when it goes down the kids could take a bear off. Kids of all ages - including grownups love bears. Bookmarked. Another great lens - congrats on the LOTD. I love teddy bears, so I LOVE this tree! I'd love to have one, but I don't have that many bears. :) Congratulations on LotD! Congratulations on lens of the day. As a teddy bear lover I intend to give this a try! Congratulations on Lens of the Day! Very unique and awesome concepts. 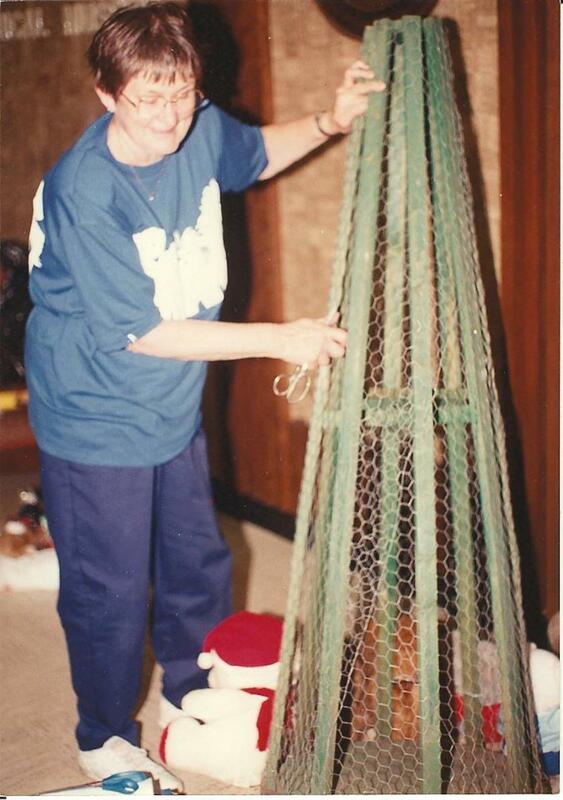 I have been through so many types of Christmas trees but it is a wide idea mounting to the top. Thanks for this outlook. What a cute and unique idea. Very lovely. Alas, I haven't enough teddy bears, yet the idea is one I will for sure pass along. Congratulations on LOTD. This is so cute. What a great idea. 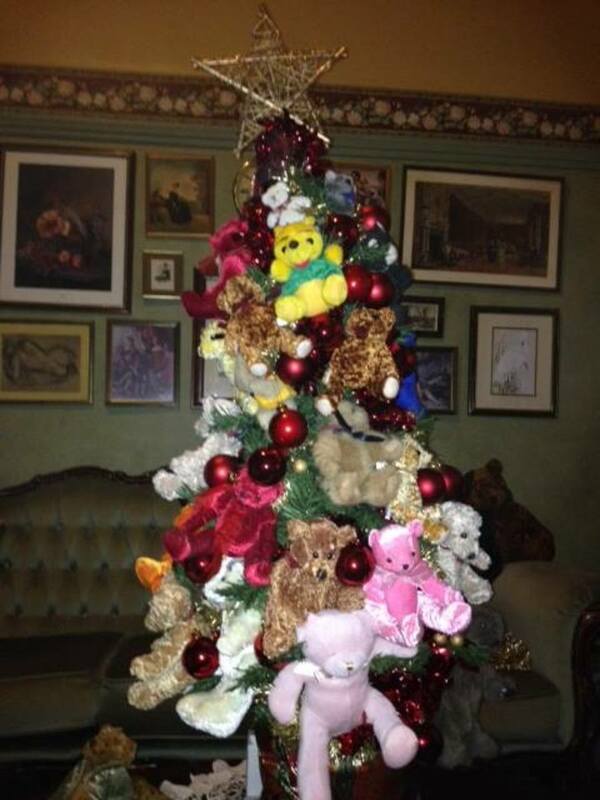 What a beauty of a teddy bear tree! The directions seem so easy to follow. I won't be doing it this year but you can bet I will use this idea eventually! It would be great at a school classroom Christmas party and let each child pick a teddy bear off the tree to keep! This is so cute! Congrats on LOTD. I LOVE this idea! I did have. Thrift shops aren't accepting stuffed animals as gifts anymore because of health regulations. I've got several in really good shape I don't know what to do with. They have hardly ever been used. Congrats on earning LOTD! Congratulations on Lens of the Day! It's a very well done lens with good photos to help explain the process. I hope the lens gets lots of views this month. What a great idea! I think I might try that! Back again to say Congratulations on your Lens of the Day. This is a perfect project for this time of year, and a great lens. Thanks for sharing. This Teddy Bear tree is adorable! Thanks for the idea and the how to! I do have some teddy bears, but not enough for a big tree. This would be a great project for the lobby of a Children's Hospital. Thank you so much for sharing. My aunt has a lot of snowmen, this would work great for those also! I have to share this article with my mom - great posting! Great idea! Definitely a different spin on tradition - but it works! This is such a beautiful project! Thank you so much for sharing your prize-worthy Lens of the Day! Loved your lens. I collect teddy bears. I don't know why I never thought of this. Super cute! I can see me hugging the whole tree. It's a very good idea and if I made a smaller one, I could give it as a gift to a very special child. Congrats on LOTD! Unique! Must be fun for the kiddies. Congrats! Looks so adorable! I can see kid's eyes light up when they see it! Congrats on the Lens! For sure a very unique idea, and beautiful when it's finished. Congratulations on LOTD. What a cute idea! Your instructions make it look so easy. Congratulations on your Lens of the Day award. Richly deserved! Just when you think they couldn't possibly come up with a new idea! I love your Teddy 'How To' lens. 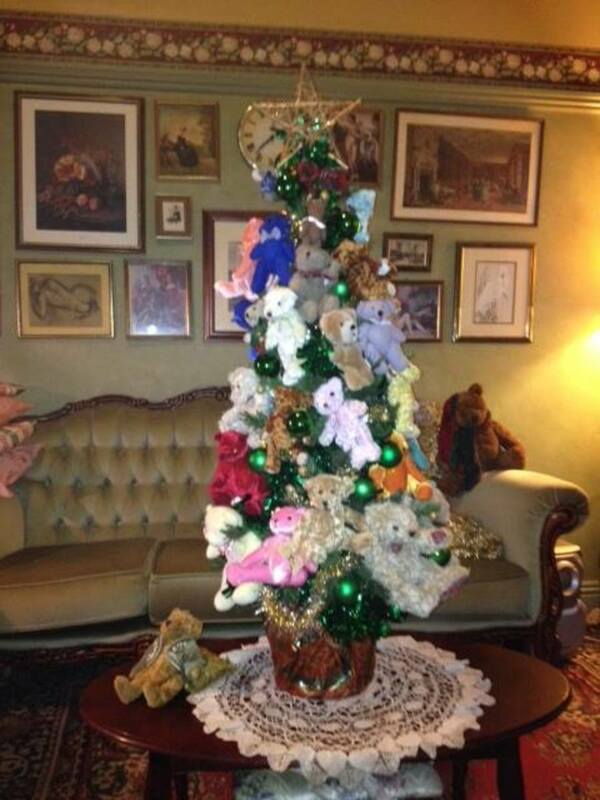 What a wonderful idea - a Christmas tree stuffed with teddy bears. So cute! I like some of these ideas for having one at shelters and hospitals. The bears would then become the gifts, maybe. What a fun idea. Thanks for sharing it with us. Congratulations on your win. Not sure I think this is so great, with that framework and kids around, but I think the idea is quite good! Congratulations Virginia! It's a wonderful idea to share! This is one of the best Christmas tree ideas I have even seen. Absolutely love it. Makes me want to create one for children at the women's shelter. Congrats on your win! So happy for you. Cute. It would be great fun in a childrens' hospital at the holidays. What a great idea, the tree is so cute! I do have some already on hand, but I have more of the Beanie Baby Dogs....so I could make a dog tree. A fun idea and your lens looks great. Love the Christmas tree background. I don't know if I can "bear" how completely adorable this teddy bear tree is! :) ha Excellent! I sure have enough Teddy Bears to create a tree so might have to try this. Great idea.